On the morning of Thursday 11th July, villagers from Awarta found that 1,500 of their olive trees had been cut down over the last month by settlers from the illegal settlement of Itamar. 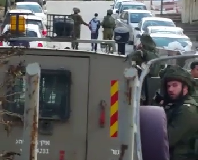 When they attempted to highlight this crime with media coverage, the mayor and several journalists were detained for several hours by the Israeli military. Four villagers of Awarta, including the Mayor, went to visit their occupied farm lands, accompanied by soldiers on the 11th of July. They have been denied access to this land for years, and are required by the Israeli authorities to apply for permission because the land has been annexed by the nearby illegal settlement of Itamar. 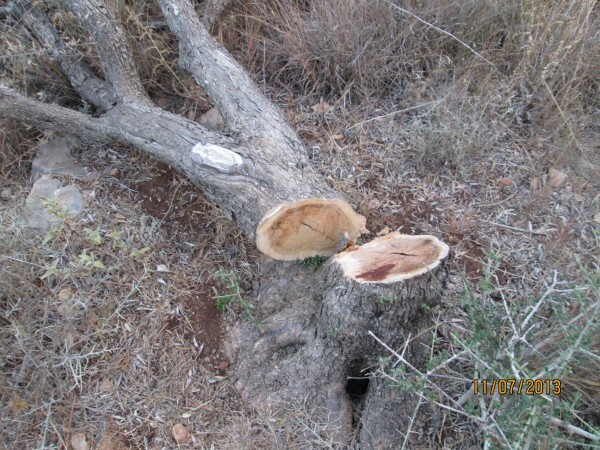 A month previously the villagers of Awarta had applied to see their lands because they could hear chainsaw noises and were concerned for their olive trees. However, they were left waiting for eight hours as no soldiers had arrived and they were concerned that they would be arrested if they went to their own land without the military. The liaison between Palestinians and the Israeli military, the District Coordination Office (DCO), called the mayor of Awarta at 11pm on Wednesday 10th, telling the villagers they would have to meet the soldiers at 5am the next day if they wanted to visit their land. This inconvenient time, especially as it is currently Ramadan, meant that only three farmers and the mayor could attend. 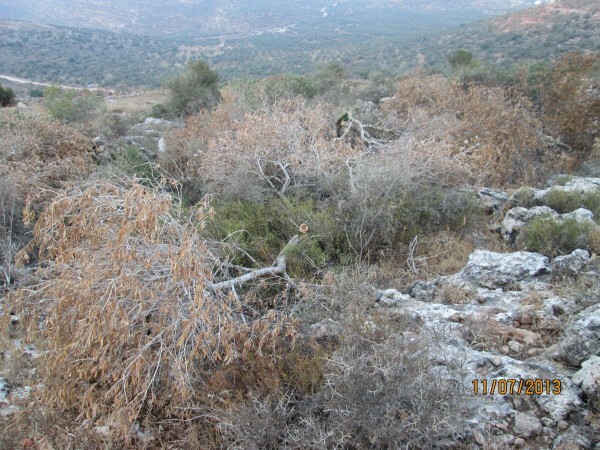 When they reached the occupied farm lands, which are owned by 22 families of Awarta, they found that around 1,500 of their olive trees had been destroyed by residents of the illegal Itamar settlement. From seeing the trees the farmers could tell by the dry stumps that this violent destruction had been going on for over a month, with the most recent trees being cut only in the past few days. The Mayor returned a few hours after this visit, accompanied by journalists who planned to report on this illegal destruction of Palestinian olive trees. 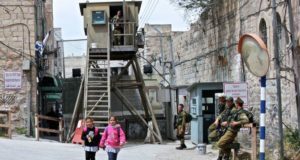 Whilst the Mayor was showing them around, all of them were detained by Israeli soldiers and held for over two hours at the nearby military base in Huwara. Even though the land is legally owned by the village of Awarta the army claimed they had overstayed their visiting permit and their presence there was illegal. For more details of the land annexation of Awarta see previous ISM report here. Villagers of Awarta also have to deal with regular attacks during settler visits to a local tomb. The tomb site is used by Muslim residents of the village as it is disputed as to who is buried there. The settlers come in the night escorted by soldiers, destroying property as they go; most recently they targeted the school, tearing down the basketball hoops. The soldiers also raid homes without notice, destroying belongings and frightening inhabitants; the latest, Saturday 6th July, resulted in the arrest of an 18 year old boy, Murad Khaled. His current whereabouts are unknown – he is still under arrest.